Quedex.net Review 2019 – Scam or Not? Due to the number of exchange/trading websites that are being released on a daily basis, we are having a hard time going through each and every one of them. But we try to cover them as soon as they are announced or an open Beta version is released. The crypto-exchange market is a huge market that attracts a lot of investors, business people and traders alike. Today, we will be looking into Quedex.net and what they can offer to an existing thriving market. Would they stand a chance against the behemoths of the trade? Or will they be another pebble in the endless beach of available exchange websites today? Without further delay, let’s talk about that! Knowing a website’s background is really important since there’s a possibility that you will be transacting with them. What could be a better assurance than knowing the background of the company that you want to transact with? Quedex Limited is registered in Gibraltar under the company number 114763. Their company address is Quedex Limited, 4 Giro’s Passage, GX1 11 AA, Gibraltar. What’s great about them is that they are a registered entity and all of their company information can be found online through their website which is awesome! The company is being managed by Wiktor Gromniak and Matt Wywial; the founders of the website. The website has been featured in Nasdaq.com, Themerkle.com, and CCN about their revolutionary platform. When it comes to verification levels, this can be a serious issue that most people do not have any time to deal with. This results in people not continuing with the transaction on the website that they have chosen due to verification curtains that restrict them from experiencing the website it its full glory. What we’re talking about are account levels that prohibit certain numbers to be reached, whether it is daily withdrawals or daily trading limits. Does Quedex.net have verification limits? First, we need to create an account on the website. In order to create an account, we need to head to their website and click on the register button found on the upper right-hand side of the screen. To create an account on the website all you need to have is an active email and a passphrase for your new account. Instead of just a plain password, they have allowed users to register a passphrase. This means that you will be able to include spaces in between phrases. The next step is to provide them with personal information that involves your complete name and your country of residence. After that, a “Session passphrase” is needed for added security. A confirmation email will be sent to the address you provided but you do not need to click on anything since you’re all good now! Good thing that the website does not have any verification levels that restrict their users from fully using all the available features that they have. This is great news for people that want to explore their website and just look around before committing to anything. One of the prominent features this website offers would be their Futures and Options trading platform. There are only a handful of websites today that offer such feature making them one of the websites we should keep an eye out for. Aside from the available platforms, users will also be able to experience an awesome website that provides a lot of information. Their “Tutorial” tab is not basic as some of you might think since it actually has something that you will learn from. They have amazing articles that will help a new trader know more about Futures, Options, Hedging, Arbitrage, and a lot more! Aside from the available articles that you can read, they also have available videos that can be of great help in understanding how their website works and how to earn from using their platform. The website offers up to 25x leverage for BTC Futures and 10x leverage for their Options. This might be one of the really few websites that store all their BTC offline. Quedex.net claims that 100% of their BTC is stored offline and withdrawals are checked manually which will require multiple signatures. Quedex.net also provides affiliate programs to people that are willing to earn from their referred family and friends. The referral link can be found under your user profile in the “Web App’s” menu which will be available once you have logged into your account. You can work your way through three different tiers of being an affiliate starting with Affiliate followed by Affiliate Partner and Affiliate VIP with bonuses starting from 5% up to 20% on the first tier of being a VIP affiliate. When it comes to security, the website plans to add a Two-Factor Authentication feature to add to their existing security measures to make sure all their customer’s accounts are safe. 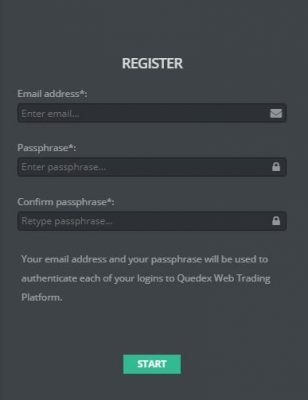 Before we move forward and take a look at their trading platform, we first need to touch their fees here at Quedex.net. At the time this review was written the current fees apply: the trading fee is -0.02% for the maker and 0.03% for the taker. Auction fees are at 0.005%, futures settlement fee is 0.03%. Please be advised that all fees are calculated using the total value of the underlying asset at its spot price. There are no deposit fees for the website and currently, BTC withdrawal network fees are free of charge. Please be advised that the website only supports BTC transactions. This means that in order to get your money in and out of the website you need to have it through your personal BTC wallet. It’s pretty simple; you just need to click the wallet tab and the deposit and withdrawal information will be provided. As of this moment, the website only caters BTC, but this can change in the future; only time can tell. Now that we’ve talked about how to create an account, the website features in general and how to get your money in and out of the website, it’s time to tackle about trading! As you might have known at this point, the website provides two trading platforms for you to look into. This is their Futures platform and Options platform that we will be exploring with you guys today! Shown in the screenshot above is their Futures platform. On the uppermost part of the website, we have the current index prices and the server time. Right below that are the different platform options that you can choose from. Right below that will be the markets that you will be able to place orders from different timelines. The center part of the trading platform will have the available charts that you will be able to use for your trading. Below that will be information under your account like your total balance, free balance, total initial margin, total maintenance margin, totally locked for orders, and a couple more important information that you want to be visual all the time. Most of the websites today hide important information like this behind account details, but we can appreciate what the website has done with this by making this information transparent. On the same area below, we will be able to change through “Pending Orders” and “Open Positions” tab along with your order and wallet history. But how do you place an order? On the lower right-hand side of the platform is the order slip. You can get the prices filled up automatically by clicking on the price listed under the order book or you can enter it manually and place your own price. Remember, this is where the maker and the taker fees go into play. Make sure that you make enough profit by choosing either of the two. The initial margin per order is shown on the order slip along with how many contracts you want to push forward with and the BTC that has been hedged. The first screenshot we’ve got here under the Options tab is their “Put Option” and “Call Option” quotes. What is the difference between the two? A put option provides the buyer the right but no obligation to sell any underlying security at the exercise price. On the other hand, a call option gives the buyer the right but has no obligation to purchase any underlying security at the price. 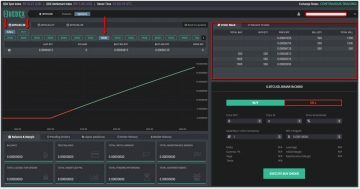 If you are interested in any of the listed quote, just click it and you will be redirected to the main Options trading platform. 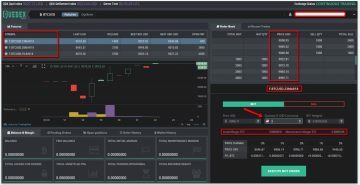 The second screenshot under the Options tab shows the platform wherein traders will be able to buy/sell their positions. Most of the platform is covered with unnecessary clutter like the huge graph and prices which can be easily tucked away somewhere easily without taking too much space. Just like the Futures trading platform we’ve got everything that we need right in front of us. The order slip is also located on the lower right-hand corner of the platform. We have always pushed for websites that provide good customer support. This is to make sure that nothing would go in the way between you and the website that you want to do business with. A great customer support system acts like a support net that will catch you in case something goes wrong with a trade or anything issue that can harm your account or personal information. A good customer service channel should always be available whenever you need any help. Quedex.net is doing great in this sector since they provide email and phone support. Their email team can be reached at support@quedex.net and for other concerns, you can email them at contact@quedex.net. If you need to talk to someone from their main office their phone number is +350 200 6840. The website also has social media accounts on Twitter, Facebook, and LinkedIn. Currently, the website is still in Beta phase; this means that a lot can still change and they might even bring a live chat support for more coverage. What are people saying about the website? Since Quedex.net is somewhat new to the market; there isn’t that much talk about anything that might alarm us. It is really important that you read about the website that you’re transacting with to be informed with current events and know if they are still in the interest of keeping your funds safe. To keep an eye out for any negative issues, please check this forum post. The website is currently in a Beta stage but we have confirmed that everything is fully operational which includes their platform, and BTC deposits/withdrawals. Knowing that Quedex.net is still not fully released, we will be expecting more features to be added in the near future. What we really loved about the website is that they are not afraid of showing the team behind the campaign. They are also registered with Gibraltar and operate under their jurisdiction. We will be keeping an eye out for the progress of this website and will show you guys what they have become a few months from now. Would they stand the chance against behemoths of the trade? Only time can tell, and the addition of new features can be an answer to that question! 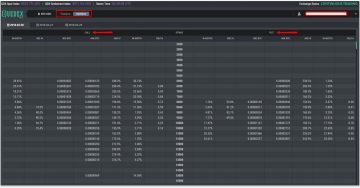 If you’re looking into a new BTC Futures/Options website then this might be it.